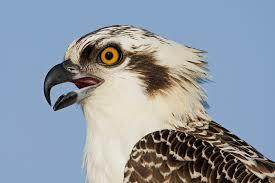 Ospreys are monogamous. 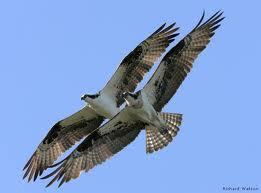 Pairs repeatedly return to the same nest site, and often remain together for many years, sometimes, for life. Older individuals and, in particular, pairs that have bred together previously, tend to be more successful than newly formed pairs. “Sky dances” incorporate undulating flights, which sometimes reach heights of 300 feet or more. At the top of each undulation, males typically hover briefly with their legs dangling and their tails fanned, and then dive downward with their wings drawn in. They may repeat this sequence several times. 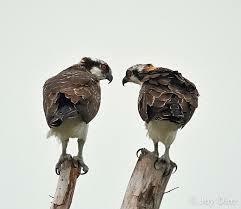 During courtship, males also provide food for their mates, follow them closely, and chase away other males. “I couldn’t help but laugh. I’ve never seen the Doctor so animated,” thought Harriett. Ozzie and I were building the foundation for our new nest. 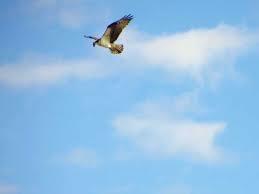 In a moment of spontaneity, Ozzie leaped off the platform and flew straight up, high over our new home. The Doctor look surprised, but then suddenly he realized Ozzie was about to Sky Dance. 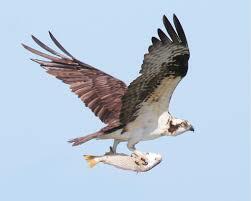 And what a spectacular display did Ozzie perform. He’s always been good at Sky Dancing, but today he provided a magnificent show. The Doctor jumped up from his rocker. He began yelling for the female H. sapien with whom he lives. “Come Female H. sapien! Come now!” The Doctor cried anxiously. “Come now! You’re going to miss it!” The Doctor yelled. The Doctor was overly excited. Ozzie put on a spectacular display of his aerobatic skills. Later he told me he was just bearing witness to his love for me. It was a masterful Sky Dance. You know, I really love that bird. Anyway, I was trying to keep one eye on Ozzie and the other on the Doctor. The Doctor was hooting and hollering, and jumping up and down, and calling for the female H. sapien in such a way I could not help but laugh. It has really been a wonderful afternoon.